I was impressed by the dignity and respect you afforded her. She particularly appreciated the large bay window in her room facing your beautiful gardens. Thank you for all you did in making my Nan's last year's comfortable, happy and enjoyable. It is very much appreciated. Thank you so much for the care you have given to mum, my brothers and I really do appreciate your efforts and kindness. Thank you for all your help and kindness in looking after my nana, your care and support was exceptional. You do such amazing work and I am glad my grandad was in comfort with such kind people around him. Thank you so much for looking after Mum so well, we will always be grateful that we found this home for Mum, best wishes to you all. Thank you for a very happy time spent with Donald, the garden party was such a happy event, congratulations.Thank you for arranging it and inviting me. Mum was so safe, comfy and happy whilst in your care, she thought the world of you all, such lovely caring kind people. Thank you. Set over three acres of landscaped gardens next to Chislehurst common, Fairlight and Fallowfield are two magnificent Victorian mansions. Whilst Fallowfield provides nursing services, boasting the Gold Standard beacon for its end of life care. The two homes are linked, offering continuity of care from residential to nursing. The minton tiled entrance halls, spacious communal areas, library with cinema, and quiet rooms for reading or entertaining friends, compliment both residences. Both Fairlight and Fallowfield have Wi-fi Internet connection available throughout, with PC facilities for both residents and visitors to use. 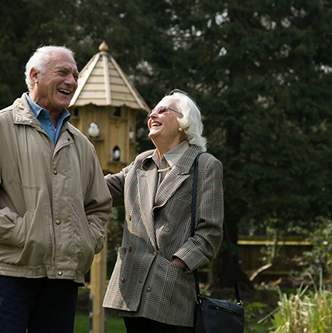 Weekly outings are organised from the home to local attractions, shops, pubs, as well as gardening and arts and crafts activities. There is also a raised vegetable patch for residents to attend to if they so wish. Fairlight & Fallowfield also has Wi-fi Internet connection available throughout the home for both residents and visitors to access. Providing personal 24-hour care and support in a professional and respectful way is our priority. We employ registered nurses, and all of our care assistants are highly trained, with continuing professional training and development both encouraged and supported throughout. Read our CQC report for Fairlight and Fallowfield below. Fairlight and Fallowfield consist of fully furnished rooms and have all been attractively decorated to a high standard including a personal television and telephone point in every room. Many of the rooms boast beautiful views of the gardens with some opening out directly onto the patio area. Residents are of course welcome to bring in their own belongings, such as pictures, small items of furniture and ornaments to make their rooms more homely; and we are always willing to cater for décor preferences. Fairlight and Fallowfield are situated on Chislehurst Common, within walking distance of the parade of shops and restaurants. From the M25 take exit 3 towards the A20 for Lewisham and South East London. Merge on to the A20(M) and follow this road for 4 miles. Take the A222 exit toward Bromley/Chislehurst and Sidcup. At the roundabout take the 1st exit on to the A222/Perry Street. Turn right on to Ashfield Lane and Fairlight and Fallowfield Care Home can be found on your left. Chislehurst station is the nearest station to the home. Upon exiting the station, walk down to the main road where bus services 162 and 269 are available to take you to Chislehurst Common. Fairlight and Fallowfield are conveniently located on various bus routes with a bus stop close by, on Bromley Lane, offering a number of services in and around the area including services 160, 162 and 269.